The BBC has edited out a beheading from a fight scene in this weekend's episode of Doctor Who as a mark of respect following the murder of two US journalists by Islamic State. In Saturday's third episode of the current Doctor Who series, the Time Lord turns up in medieval England and encounters Robin of Sherwood. 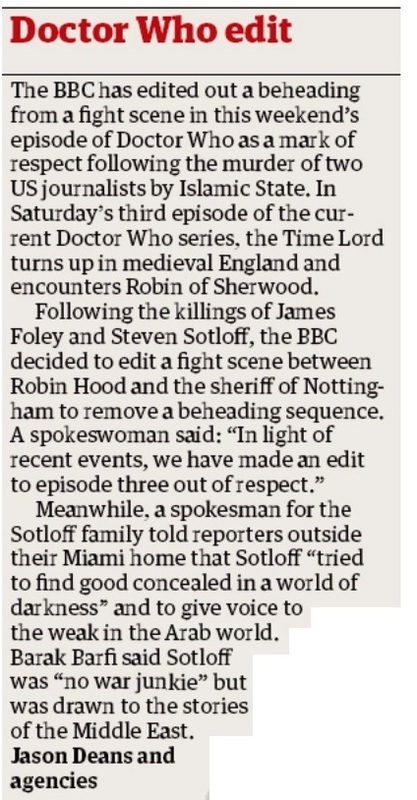 Following the killings of James Foley and Steven Sotloff, the BBC decided to edit a fight scene between Robin Hood and the sheriff of Nottingham to remove a beheading sequence. A spokeswoman said: "In light of recent events, we have made an edit to episode three out of respect." Meanwhile, a spokesman for the Sotloff family told reporters outside their Miami home that Sotloff "tried to find good concealed in a world of darkness" and to give voice to the weak in the Arab world. Barak Barfi said Sotloff was "no war junkie" but was drawn to the stories of the Middle East. APA 6th ed. : Deans, Jason (2014-09-05). Doctor Who edit. The Guardian p. 6. MLA 7th ed. : Deans, Jason. "Doctor Who edit." The Guardian [add city] 2014-09-05, 6. Print. Turabian: Deans, Jason. "Doctor Who edit." The Guardian, 2014-09-05, section, 6 edition. This page was last modified on 15 July 2015, at 22:41.